While other researchers have trapped other types of nanoparticles in vacuum, those were not optically active. The nanodiamonds, on the other hand, can contain nitrogen-vacancy (NV) centers that emit light and also have a spin quantum number of one. 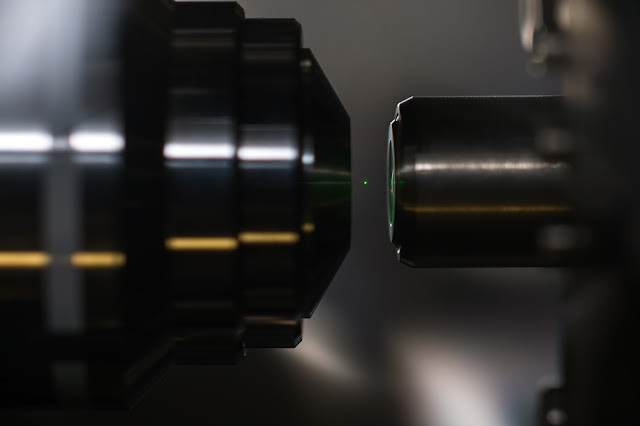 In the paper, published in Nature Photonics, the researchers from Rochester's Institute of Optics explain this is the first step towards creating a "hybrid quantum system." Their system combines the mechanical motion of the nanodiamond with the internal spin of the vacancy and its optical properties to make it particularly promising for a number of applications. In a previous paper, the researchers had shown that nanodiamonds could be levitated in air using a trapping laser. The new paper now shows this can be done in vacuum, which they say is "a critical advance over previous nanodiamond optical tweezer experiments performed in liquids or at atmospheric pressure." Nanodiamonds trapped at atmospheric pressure are continuously agitated by collisions with the air molecules around them. Trapping the diamonds in vacuum removes the effect of all these air molecules. "This allows us to exert mechanical control over them," said Levi Neukirch, lead author of the paper and a Ph.D. student in Vamivakas' group at Rochester. "They turn into little harmonic oscillators." "We can measure the position of the diamond in 3D and we create a feedback signal based on the position and velocity of the nanodiamond," said Neukirch. "This lets us actively damp its motion." Neukirch said that this is done by changing the trapping potential that the diamond sees. The trapping potential can be illustrated by imagining the diamond sitting at the bottom of a valley. If the diamond moves away from the bottom of the valley, it effectively moves uphill and eventually rolls back to the bottom. The feedback mechanism the researchers have created changes the shape of the optical potential well, so that the hill is steep when the diamond climbs it, but gradual when it rolls back down. Eventually the diamond would just oscillate a tiny amount at the bottom of the valley. This, Neukirch stated, is their long-term goal: to damp the diamond's motion until it is in the ground state of the system, which would make the system behave as a quantum mechanical oscillator. "We have demonstrated the ability to control the NV center's spin in these levitated nanodiamonds," Neukirch said. He explained that the defect's electrons had to take on specific spin states, two of which are normally "degenerate," meaning in this case that states with spin values of +1 or -1 have the same energy. "Without applying a magnetic field these two energy levels are the same, but we can separate them with magnetic field, and they react differently to it. If there was an electron in the spin +1 state and you then applied a magnetic field, the whole nanodiamond would feel a push, but if it was in the spin -1 state it would feel a pull," he said. "Because the electron spins are intrinsically quantum mechanical, they can exist in something called superpositions. We can create a state where a single spin is in both the +1 and -1 states simultaneously. If we can mechanically place the nanodiamond in the ground state, this would allow us to both push and pull on the spin, hopefully generating a mechanical superposition of the entire diamond. This is a curious phenomenon that physicists are interested in studying, and it is called a macroscopic Schrödinger Cat state." Neukirch also said levitating nanodiamonds in vacuum could be used to measure "extremely tiny forces or torques." The nanodiamonds are in effect nano-oscillators, and any force, even if tiny, will move them slightly. Neukirch added that their "setup is capable of detecting these small motions." Neukirch will be starting as a postdoctoral associate in Vamivakas' group this month, continuing this work with the aim of achieving levitated, optically active nanodiamonds that are not destroyed at low pressures.